I was on deadline during the summer, and it was hard to write with all three kids out of school. I ended up hiring a babysitter so I could go to the library a few hours every day just to find the time. There were a lot of days that I didn’t feel like writing, that the inspiration wasn’t flowing. But I forced myself to write anyway. I put my nose to the grindstone and kept going, even though I was terrified that it wasn’t any good half the time. And you know what? When I finished and went back through to revise it, I realized it was actually really good—that I loved this book and was extremely proud of what I’d been able to accomplish. It taught me that I can write well, even under pressure and even when I don’t “feel like it.” I learned that writing every day, no matter what, really does work. And it showed me that I can take on difficult challenges and do them well! What do you hope readers will take away from IGNITE? 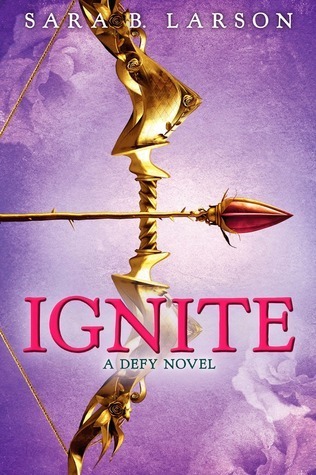 I hope that readers who read IGNITE will come away from it loving this world and characters even more, having gotten to know Alexa, Damian, and Rylan even better. I hope that readers will be excited about this next part of their journey and eager for the conclusion! And I hope that they will also recognize their own strength, and their own abilities to overcome whatever trials they might be facing. I know not many of us have to deal with evil sorcerers or terrifying jungles or impending wars, but we all have struggles and situations that we have to face. I hope that Alexa's story will help inspire, or at least be a fun escape from the realities of life. I have to write whenever and wherever I can. My husband travels for work, and I have three young children with crazy-busy schedules. So when I do sit down to write, whether it’s at my dining table, sitting on my bed, in the library my husband built me, or if I manage to escape to the city library or somewhere else quiet, I always put on headphones and listen to my playlists when I write. I mostly use instrumental scores from movies, as well as some of my favorite artists. Music really helps me get into the emotional place I want to be for my writing, even when I have Doc McStuffins on in the background and three wild and crazy kids fighting over bowls of popcorn. 1. Never, never give up! and 2. Train yourself to write every day, even when it’s hard. Set your own deadlines and stick to them. Act like you are published now, so that when you are published and if you get hit with a hard deadline, you’ll know you can handle it. SARA B. LARSON can't remember a time when she didn't write books, although she now uses a computer instead of a Little Mermaid notebook. Sara lives in Utah with her husband and their three children. She writes during naptime and the quiet hours when most people are sleeping. Her husband claims she should have a degree in "the art of multitasking." On occasion you will find her hiding in a bubble bath with a book and some Swedish Fish. Her website is www.sarablarson.blogspot.com. Neat post! And the book sounds great! otherwise it should asics tiger mexico 66 sale be staged waterfalls three thousand Cheap Asics Running Shoes eet of mad vomit. Roared sale, my brother has been sent to buy gas masks, about the day after Cheap Asics Running Shoes Asics Australia Online omorrow will be able to buy it back. Cheap Asics Running Shoes heap asics gel lyte iii sale think anyone can not help but have a strong want to vomit. Secretly glad not much to eat in the evening, long digestion is completed.